This irrepressible husband and wife team has initiated a quiet revolution in music often regarded as too rarefied to attract a large following. They are changing that perception and garnering new fans. Every winner of Musical America’s prestigious “Musician of the Year” Award is a distinguished master of the craft, and this year’s recipients, cellist David Finckel and pianist Wu Han, are no exceptions. He was a protégé of Mstislav Rostropovich; she, a veteran of top-flight musical training grounds like Aspen and Marlboro. Critics have praised the boldness, imagination, and collaborative intimacy of their work—often trumpeting his laser-like focus and her innate spark. 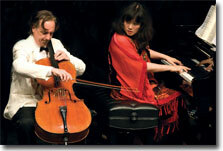 But performing is merely a starting point for this irrepressible husband and wife team, whose résumé includes the stewardship of important arts organizations like the Chamber Music Society of Lincoln Center and Music@Menlo; a history of innovation in programming, recording, and outreach; and a commitment to fostering young talent. Along the way, they have built audiences and shaped a new wave of players. To call them overachievers would be an understatement. Remarkably, they have done it all in a genre that has often been regarded as too rarified and intimate to attract a sizeable following. Chamber music thrives on closeness, like good conversation. Contrast this with the hi-octane appeal of an orchestra at full throttle, or the dramatic spectacles of grand opera. Singing the praises of chamber music has often seemed roughly equivalent to encouraging people to eat their spinach. But over the last decade, David Finckel and Wu Han have initiated a quiet revolution, changing that perception and garnering new fans. And they have done it through sheer determination and elbow grease. It wasn’t always easy, especially before they joined forces. David Finckel was just another struggling musician, playing with a chamber orchestra in Philadelphia and living with his parents in New Jersey, when fellow cellist Julian Fifer offered advice on breaking into the New York scene: If people don’t see you eating cold sesame noodles at Empire Szechuan on 97th Street, they won’t know you are available for work. “So I moved one block away from the restaurant,” he remembers. It took a year and a half, he reports, before he was in the Emerson String Quartet. He could hardly believe his luck. Wu Han had a more strenuous journey. She worked intensely in Taiwan under difficult circumstances, became the best in her class, but was refused permission to travel to the United States before the age of 20. Yet, these two were destined to meet. At the Hartt School in Connecticut, where David was on the faculty and Wu Han had enrolled as a student, they played together for mere minutes before encountering both St. Cecilia and Cupid. “I will never forget that moment,” comments the cellist. “She wore overalls and sneakers. She smoked. She knew only Chinese. But as soon as she played piano, it was like we spoke the same language.” It marked the beginning of a new life path for both of them. And this year they are celebrating the 30th anniversary of that musical union. Each achievement became a steppingstone. In 2004, they brought the lessons of their experiences at La Jolla and Music@Menlo to the Chamber Music Society of Lincoln Center. The institution was, says Executive Director Norma Hurlburt, already on a solid footing, but under their tutelage it clearly switched into a higher gear. The CMS II program, which features younger musicians, was expanded, and its members were for the first time integrated into ensembles with more experienced veterans. Season composers were commissioned, and master classes added to the schedule. Touring was increased, with residencies in Taiwan, Korea, and Germany. This past year saw the first Chamber Music Society performances in England—a three-concert series at Wigmore Hall. An inveterate tinkerer, Finckel initiated the use of new technology, with online radio streaming, special videos, Facebook, Twitter, and iPhone applications. The organization’s national radio series went from 13 one-hour programs to 26, and recording activities exploded, including a Deutsche Grammophon live download series and the launch of an in-house label. In each area, Finckel and Wu Han have been determinedly hands-on, and willing to take risks. For example, last year they introduced a series called “Late Night Rose,” in which concerts normally offered in the Society’s Rose Studio at 6:30 PM are repeated at 9:30, but with new twists: At the later show, an engaging host introduces the music selections, and patrons are seated at candle-lit tables and given a glass of wine. It has been a remarkable success. At the opening weekend of Music@Menlo’s summer program last July, as a group of international students rehearsed a program of Schubert and Brahms, David Finckel made suggestions to the string players about using vibrato to create a more beautiful blending, while Wu Han pointed out subtle interpretive errors—like arriving at a crescendo too early—and offered tips to the pianist and cellist on how to coordinate their attacks so that entrances would be cleaner. All the while, Finckel also toyed with various microphone placements. It’s clear that the technology bug is in his blood. He is forever finding ways to use it in the service of a musical or educational end. “He’s the only person I know who recorded a cello lesson in an airplane toilet at 36,000 feet,” says Guzelimian, referring to one of the cellist’s 100 short video programs—shot and edited in such diverse locations as hotel rooms, empty concert stages, the streets of St. Petersburg, and, yes, an airplane toilet (a reprieve from the tedium of travel)—all posted on his Web site (davidfinckelandwuhan.com, or cellotalks.com). The same relentless drive and unerring focus evident in those video lessons made Menlo an intricate, finely calibrated organism. Its separate elements include a rigorous audition process: “Little pieces of paper with the names of musicians fill out our dining room table at home,” says Wu Han, “while we try to put together the right mix of instrumentalists, temperaments, and levels of experience. We take pictures of the tabletop in case someone accidentally opens a window and they all blow away. "Students are carefully assessed, placed in an ensemble, and given specific repertoire to learn. Even the interns receive intense training and create their own memoirs from their Menlo encounters—recording what worked and what didn’t—to pass on to the next generation of participants. One gets the feeling that should a young student sniffle, David Finckel and Wu Han would show up within minutes with a box of tissues. early experiences set the stage for what was to come. and viola she was hugely disciplined (“I fell so madly in love with music that I became obsessive,” she claims), turned into a spectacular sight-reader, and was soon playing concertos on short notice. “I was given only two days’ notice to learn the Mozart K. 466,” she remembers. And she managed to do it. When they met at the Hartt School in 1982, she had won a competition to perform with the Emerson. Verbal communication was not possible, but it hardly mattered. “The sparks kicked in between two notes in the Schumann Quintet,” remembers Finckel, “a G to an A, in the first cello solo in the exposition of the first movement.” (As he related this, both musicians began to sing the piece.) “She was the first pianist ever to allow me the little extra time needed for the note to bloom at the top. I will never forget that moment: It was like she was inside my head. After that, I couldn’t get her out of my mind.” They were married in 1985. Stuart Isacoff is on the faculty of the Purchase College Conservatory of Music. His latest book is A Natural History of the Piano: The Instrument, The Music, The Musicians—From Mozart to Modern Jazz and Everything in Between (Knopf ).